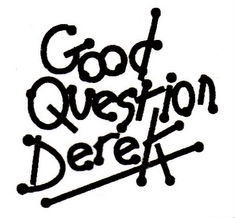 Every modern beat combo seems to have a myspace site, so I've created ours at www.myspace.com/goodquestionderek . It doesn't have any more information than this blog site but it does allow you to download a few songs (I understand that the download functionality of Last.fm is still not sorted). Why not join myspace.com and become one of our friends? As Microsoft are jumping on the personal web space band waggon I thought it'd be a good idea to create a GQD site on their Live Spaces website. Check it out here. Again, there's not a great deal more than is available here but I thought I may as well continue the GQD campaign to dominate the web!! !